This image taken by NASA's Spitzer Space Telescope shows the "South Pillar" region of the star-forming region called the Carina Nebula. Like cracking open a watermelon and finding its seeds, the infrared telescope "busted open" this murky cloud to reveal star embryos (yellow or white) tucked inside finger-like pillars of thick dust (pink). Hot gases are green and foreground stars are blue. Not all of the newfound star embryos can be easily spotted. Though the nebula's most famous and massive star, Eta Carinae, is too bright to be observed by infrared telescopes, the downward-streaming rays hint at its presence above the picture frame. Ultraviolet radiation and stellar winds from Eta Carinae and its siblings have shredded the cloud to pieces, leaving a mess of tendrils and pillars. This shredding process triggered the birth of the new stars uncovered by Spitzer. Eta Carinae's home, the Carina Nebula, is located in the southern portion of our Milky Way galaxy, 10,000 light-years from Earth. 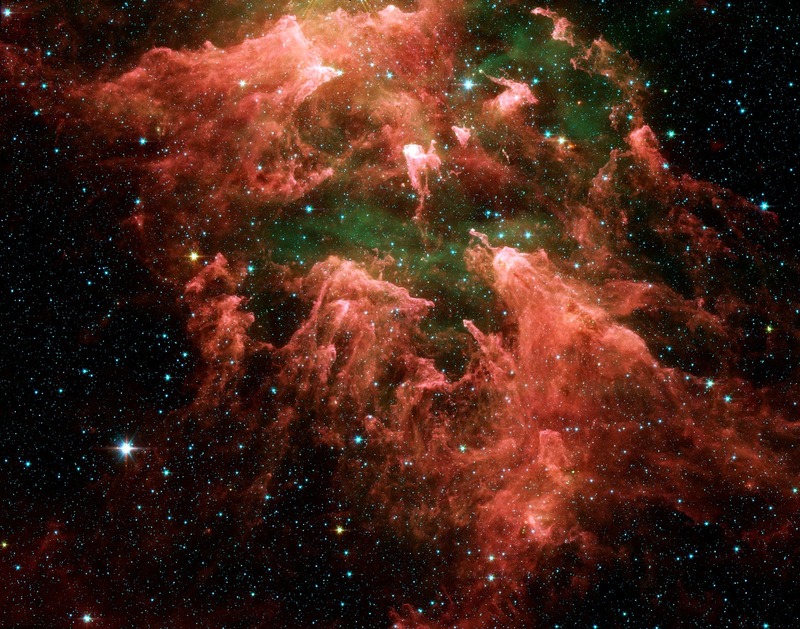 This colossal cloud of gas and dust stretches across 200 light-years of space. Though it is dominated by Eta Carinae, it also houses the star's slightly less massive siblings, in addition to the younger generations of stars. This image was taken by the infrared array camera on Spitzer. It is a three-color composite of invisible light, showing emissions from wavelengths of 3.6 microns (blue), 4.5 microns (green), 5.8 microns (orange), and 8.0 microns (red).